The foldable drones are quickly becoming one of the most popular consumer quadcopter in the market category. 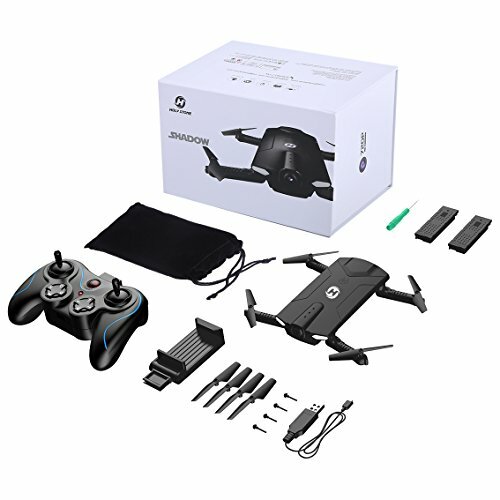 If you have seen expensive foldable drones such as DJI Mavic Pro 2 (See Price) and DJI Mavic Air (See Price), you will learn to understand why people love foldable quadcopters. Especially when you are a beginner or first time flyer looking for the best and durable drone to start with. In the HS160 Shadow drone review, I will talk about four key categories: build & design quality, performance, features and camera quality. 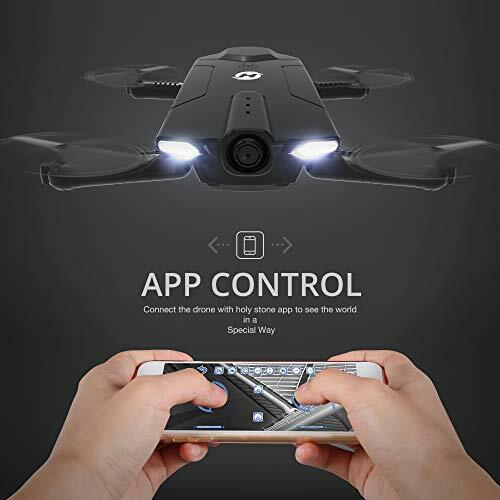 The Holy Stone HS160 Shadow drone (See Price) was released during February 2018 and quickly became popular among consumers. Because the introduction of foldable body design brings completely new category that revolutionize how we can take the drones with us. Moreover, the drones are becoming modernize. 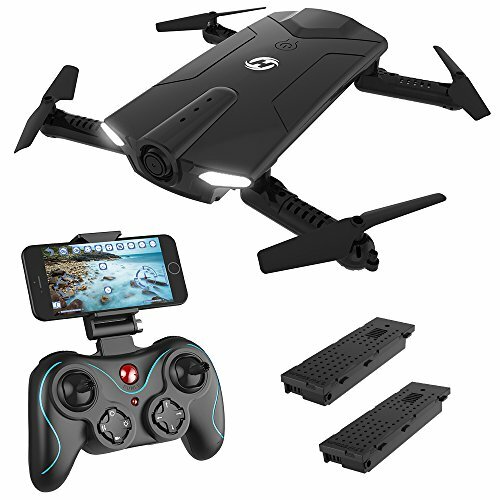 Like Holy Stone HS160 Shadow, similar drones such as X12 Drone (See Price), DROCON Ninja FPV (See Price) and Thunder FQ35 (See Price). Read more in my HS160 Shadow drone review to find out if this is the drone for you. Let’s dive into the details. The HS160 Shadow drone has taken on a more modern appearance approach. Coated with black coloring around its hull body and durable plastic motor arms. 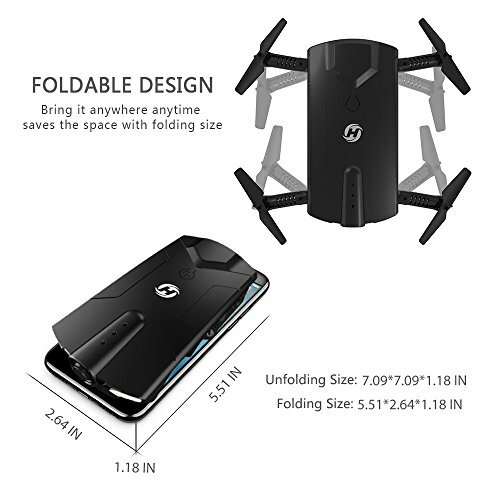 Its foldable body design provides the drone additional durability quality. Underneath the drone’s body is where the battery is located at. Like most of the modern drones such as Guard FQ36 (See Price) and L6060 Drone (See Price). The HS160 Shadow drone uses modularized battery that provides it improved flight time and protections against overcharge and discharge. The motor arms are foldable that can be easily folded and stuff in your pants’ pocket. When it is folded, it looks like a cellphone at plain sight. Moreover, its unique foldable design makes it very easy for you to take with you anywhere you go. At the front and rear, the drone has LED lights that acts as an important feature for both beginner and experienced remote pilots. The visual positioning provides support to being aware of its position during both day and night time. One of the most important category in the HS160 Shadow drone review is performance. Afterall, beginners and first time flyers like you want to be able to fly the drone without having hard time controlling it. When it comes to shopping for the drone, the first thing that comes to mind: is it easy to control? Today, most of modern drones you will see comes with improved gyroscope that provides the drone more accurate and responsive barometer to the changes in air pressure for better stability. Some advanced drones such as Potensic T18 Drone (See Price) is equipped with the latest 9-axis gyroscope. The Holy Stone HS160 Shadow drone, on the other hand, uses 6-axis gyroscope. Although as it is not advanced as expensive models that uses state of art GPS and GLONASS features for stability and smooth controls. This quadcopter is relatively easy to fly around thanks to upgraded 6-axis gyroscope and built-in barometer that detects the air pressure and adjusts accordingly. The Holy Stone HS160 Shadow has an average flight time of minutes. Plus, it has a control range up to 70 meters. Admittedly, it is a little disappointing since few drones in the same price range are beating HS160 Shadow in the performance category like X12 Drone (See Price) and CoFight IN 1802 Drone (See Price). Although, while the Holy Stone HS160 Shadow is apparently a very popular foldable drone among consumer. 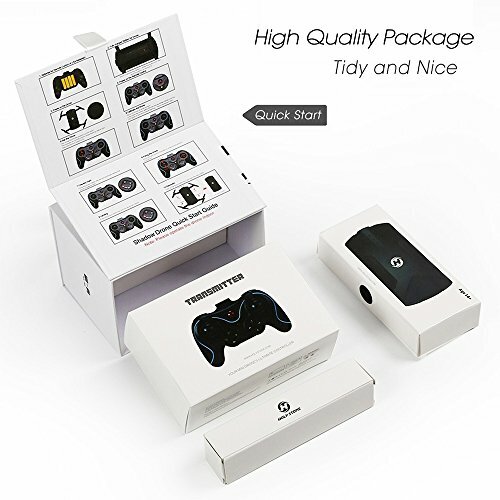 it boasts great stability and smooth controls. 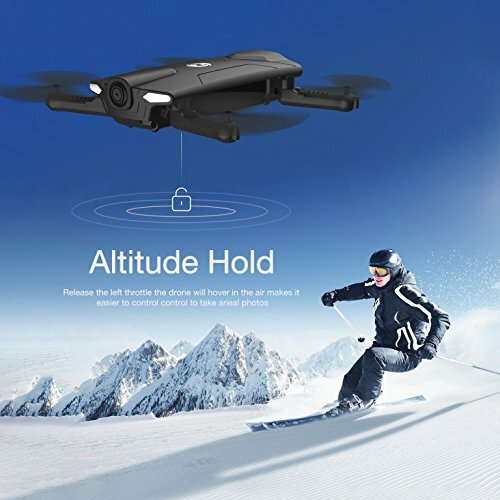 Unlike these drones, the HS160 Shadow drone comes with a micro SD card slot which you can insert inside and store the videos / pictures that you took with the drone. These videos and pictures will be retained at its highest quality compared to those saved on smartphones that typically is lower quality. When flying the drone, the HS160 Shadow responses to the controls with precise and smooth flight movements. The features are what most of the people are looking nowadays. We want X that does Y. Before intelligent and portable drones like DJI Mavic Pro (See Price) was introduced. The drones only can perform stunt tricks and fly around. As the drones are becoming smarter, the consequences is that the toy-grade drones under $100 are getting more features. Which means these drones like HS160 Shadow (See Price) is becoming easier for beginners to fly. Plus, you get more features such as the ability to capture videos, take pictures and even more at much lower price value. Features-wise, the HS160 Shadow comes with two beginner-friendly functions: headless mode and altitude hold. The second function is pretty much self-explanatory. However, the headless mode switches the control orientation to your remote controller. Which means you can control the drone based on levers movement regardless of its face direction. The next important feature is the speed mode. 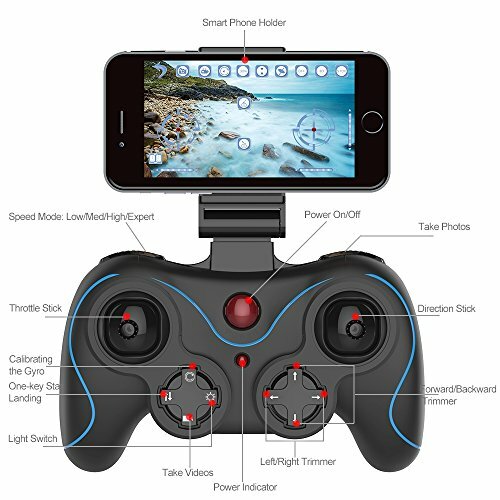 Holy Stone HS160 Shadow drone comes with four speed mode that helps first time pilots practice and hone their flight skills gradually. When you are flying the drone for the first time, it will be at its slowest speed by default. This lets beginners learn the basic flight controls. As you practice and master the movement, tricks and more. You can switch the speed mode to challenge yourself. In no time, you will be flying like an expert. Lastly, most of the features that you will gain from using the smartphone app with the drone. You can control the drone using your smartphone via Gravity Sensor mode. What this means is the drone fly based on your smartphone’s orientation. If you tilt the smartphone to left, the drone flies to the left and vice versa. Additionally, you also can perform 360-degree stunts with Holy Stone HS160 Shadow drone to impress bystanders. What is to love when you can fly a drone that is capable of capturing aerial images? In our HS160 Shadow drone review, I will talk about the camera quality. 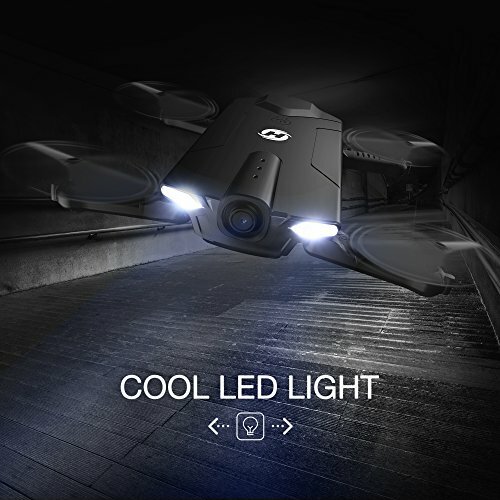 The Holy Stone HS160 Shadow drone comes with a built-in camera located at the front. 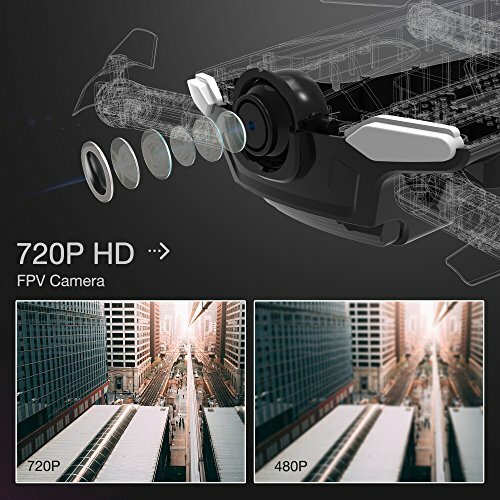 It is capable of taking stills and videos using 720p HD. The camera can record videos up to 720p HD at 30 frames per second. Although, if you are looking to start your own aerial services business to make money, I would suggest Mavic Pro 2 (See Price) or Phantom 4 Pro (See Price). The Holy Stone HS160 Shadow drone camera isn’t the best. But it does make a great training experience for those who wants to learn how to take pictures from the sky. In addition to that, beginners will have the opporunity to train and learn how to fly a drone. That way your skills will grow and is applicable to high end models. Because HS160 Shadow drone uses a 720p HD camera, the resolution of images are much more clear and less pixelated compare to the drones that uses 480p camera. However, you will have to learn how to take advantage of the lighting quality to produce stellar images. Since the HS160 Shadow (See Price) uses a camera that doesn’t performs too well in low-light area, you will need to rely on sunlight to capture the moments. As I wrap up the HS160 Shadow drone review, there are few thins to be said about this foldable quadcopter. The HS160 Shadow (See Price) drone comes with an extra battery. Which means you will have a total flight time of 16 to 18 minutes. This is actually pretty good deal and definitely a steal at its price range. Like most of the drones in the same price range, the HS160 Shadow drone offers beginners a great stability, ease of use and of course cool features to keep them company. Beginners and those who wants to become an aerial photographer will find HS160 Shadow (See Price) as an easy choice to start with. Additionally, HS160 Shadow drone has a great aftermarket support. You can find extra batteries, extra propellers, replacement motors and travel case. We hope you find the HS160 Shadow drone review helpful and insightful. If you have any questions that you want to know more, please feel free to ask and we will answer back to you right away. HS160 Shadow drone is a decent foldable quadcopter for beginners. It is affordable and filled with useful features that makes it easy to control and learn how to fly. A combination of sleek design and easy to carry with makes it the perfect choice for beginners who wants a durable drone to start with. HS230 RC Racing Drone Review: Aerial Racer Made for Beginners? Mavic 2 Intelligent Flight Battery Review: Worth Extending Your Flight?